(Photo: © Peter Kenny / Ecumenical News)Germany's Federal Minister of the Interior, Thomas de Maizière, speaking on the European refugee crisis at a World Council of Churches/United Nations high level conference on the Refugee Crisis in Europe. 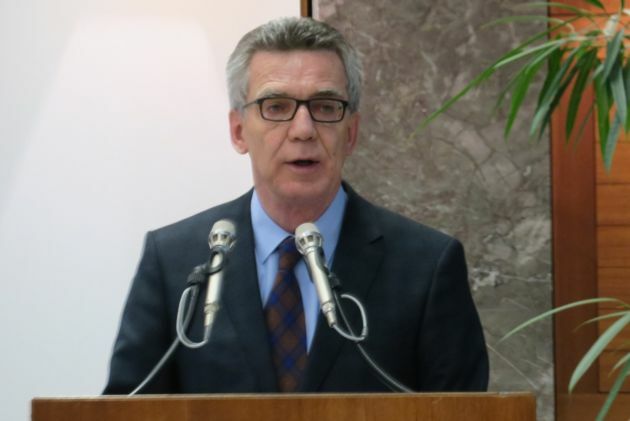 "Nor is it only the task of the government in the European countries receiving refugees," said de Maizière on Jan.18. "The extraordinary political, social and humanitarian chllaneges raised by the refugee crisi clearly show that government, civil society, businesses and also churches have a shared responsibility," said the minister. "The refugee crisis asks of us all." De Maizière said he was speaking as the interior minister, as a German politician in Europe, as a European, and also as a Protestant Christian. He is a member of German Chancellor Angela Merkel's Christian Democratic Union party. He said the "real number of asylum seekers that Germany received last year was 1.1 million, although the official number under official administrative government procedure was 425,035. A number of speakers said that solving Europe's refugee crisis needs a solution to the five-year long war in Syria and hopes rest with potential talks next week. "The countries of Europe do not have unlimited resources to take on the seemingly unlimited need and despair in many parts of the world, especially Africa and the Middle East," said de Maizière. "Europe's capacity to take in an integrate refugees and migrants is limited," he cautioned. "Even though we as Christians would like to help every person in need, we know that we cannot offer unlimited charity – at least in the form of taking in everyone seeking protection here – without sacrificing ourselves and our society." De Maizière said that due to the growing numbers of refugees and asylum seekers,leaders must take seriously the public's worries and fears. "Migration also has its dark side: It can lead to conflicts, and having to confront the unfamiliar can feel threatening. "We must be realistic about our society's capacity to help the way we would like. Receiving refugees and asylum seekers and meeting our humanitarian obligations entail great burdens, both on site and for society as a whole," said the interior minister. Speaking the same conference, the general secretary of the World Council of Churches, Rev. Olav Fykse Tveit, said that European countries and people "must live up to their humanitarian values and standards reflected in commitments to international conventions." "This must be evident in a crisis for so many refugees that are coming to Europe or who are already in Europe," said Tveit, a Norwegian Lutheran. He said there is a need for genuinely new efforts of coordinated collaboration between the countries in Europe and between all sectors of society that can contribute, also churches and religious communities. "Through this conference we want to provide an even better and more realistic understanding of the challenges, and to encourage more commitment, calling for much better coordination and collaboration in the efforts needed to receive and assist them." One of the moderator's U.S. Bishop Mary Ann Swenson, reminded the conference that the refugee crisis is not only a European crisis. "We need to be much more open to receiving refugees in my country, [the United States]," said Bishop Swenson, a vice-moderator of the WCC's main governing body, its central committee. 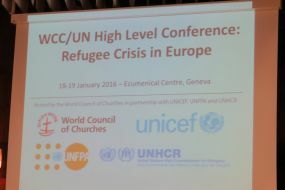 The conference was organized by the WCC in cooperation with UNICEF, the U.N. Children's Fund; UNFPA, the U.N. Population Fund; and UNHCR, the office of the U.N. High Commissioner for Refugees.